As you maybe know, I eat a VERY plant-based diet. And my main focus is to eat fruits, veggies (starchy or non-starchy) and leafy greens. And although we raise our own beef and can buy an organic hog each year, I also have been minimizing my animal fats and using more avocado and coconut oil for fat sources. If our liver is busy making bile to help digest fat, he can’t pitch in to help detox as much. So I am eating a lower fat diet – and more plant fats instead of animal fats – as I work on my liver health. Johny and I LOVE grilling vegetables in the summer months! It gives them a unique flavor without heating up the whole house by baking in the oven. And it just makes it FEEL like it’s summer. I must point out that it is important that when we grill, I make sure we eat foods to help us neutralize the toxins (heterocyclic amines, advanced glycation end products, and acrylamide) created from the grilling process. So we always eat a large, leafy green salad and then a veggie like steamed broccoli or steamed asparagus. I like to steam because it moistens the food and it keeps the fat content low. Portobello mushrooms can be used as a hearty vegetarian alternative to burgers and steaks at all your summer barbecues and even all year long. This meal will be ready in under 30 minutes. It is substantial enough to eat on its own or pair it with grilled veggies and your favorite whole grain as a side. The recipe is meant to be served as whole portobello just like a burger or a steak, however you could also use sliced and sauteed mushrooms and serve as an appetizer or side (as seen in the image above). Note – when I buy avocado’s, I buy them firm. If you buy them already ripe, hundreds of people have squeezed them in the store to see if they are ripe. And so I’m always disappointed when I get home that they are so bruised. So plan that part ahead! 1. Combine the mushroom marinade ingredients in a small bowl and whisk together. 2. Place the mushrooms in a shallow baking dish, bowl, or large ziploc bag. Cover them with the marinade from step 1 and let sit for about 10 minutes (5 mins on each side if not mixed in a bag). 3. While the mushrooms marinate, prepare the chimichurri by whisking together all ingredients except the avocado. Once mixed add the avocado cubes and gently toss to combine. 5. Place the marinated mushrooms on the grill and cook ~3 minutes on each side. If desired, brush the excess marinade on the mushrooms for added flavor as they cook. 6. 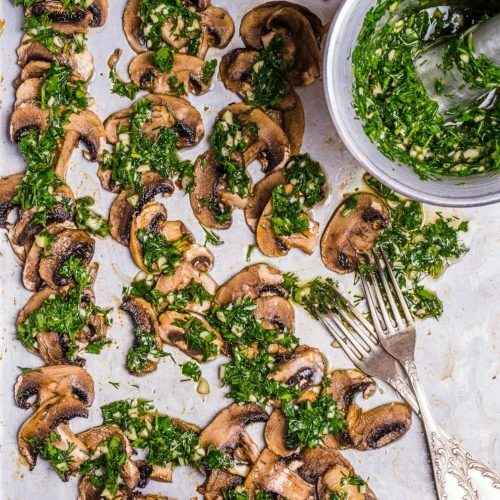 To serve, top the mushrooms with the avocado chimichurri.